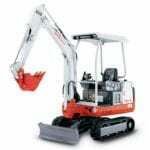 A diesel powered mini excavator ideal for trenching, excavation and site preparation. A diesel powered mini excavator ideal for trenching, excavation and site preparation. 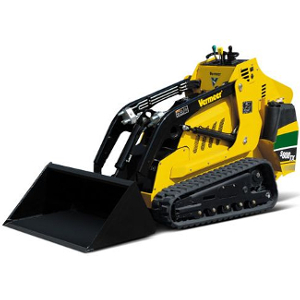 Features 200mm, 350mm, 450mm Toothed Buckets and a 900mm Scraping Bucket, backfill blade, adjustable rubber track width and a vertical digging system of up to 15å¡ (compensation for sloping sites) With Full 360å¡ slew this machine is ideal for narrow access and working close to walls. Machine comes on Heavy Duty Trailer, enquire for heavy duty towing restrictions. 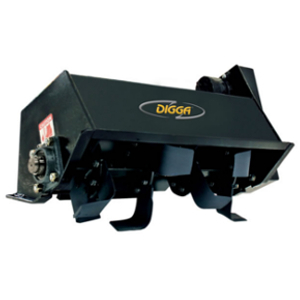 *We also have a Ripper Attachment, Post Hole Borer, Sleeper Grab, Hydraulic Rock Grab and Hedge Trimmer Attachment for this machine. *Video shows a similar model with an enclosed cab, the unit available has a ROPS protection but is not enclosed. 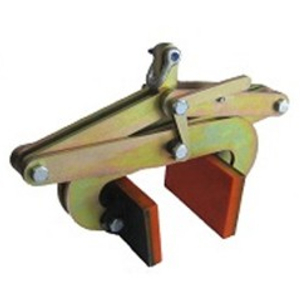 An attachment for easy placement of sleepers. 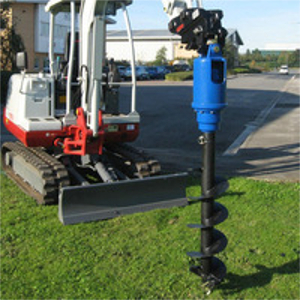 A hydraulic powered auger drive unit. A diesel powered track driven mini skid steer.